Info "Save Link from the ChuChus!" Zelda is one of 9-Volt's microgames in WarioWare: D.I.Y. Based on release dates, it is set in the Nintendo DS game The Legend of Zelda: Phantom Hourglass. Link is standing in the middle of a field with one heart left. As the game starts, three ChuChus walk toward Link from three sides of the stage. When a ChuChu is touched, it flashes, falls over and disappears. 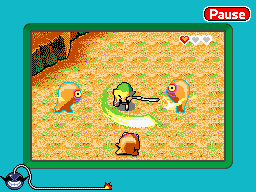 To win, the player must tap all three ChuChus before one of them hits Link.